St.Thomas church was built in 1842 just 1 years after the Primitive Methodists built the Memorial Chapel and the same year that the Wesleyan's had their chapel built. In "The Staffordshire Advertiser" dated 7th August 1841, an advert was placed for builders, which read. Persons desirous of Contracting for the erection of the above named church may inspect the necessary Drawing Specifications, on application, to the office of Mr Stanley. Architect, Albion Place, Shelton. The tenders to be sealed up and enclosed to Mr Stanley, on or before Saturday, the 21st August next. The committee do not pledge themselves to accept the lowest tender. The church itself is built as you might expect from Mow Cop stone and was the first Church of England church to be built on Mow Cop hill itself. It cost £1400 to construct; £300 of this was to come from the government. It had a seating capacity of 500 sitting and boasted a large gallery with a well tuned organ, built on the West Wall. 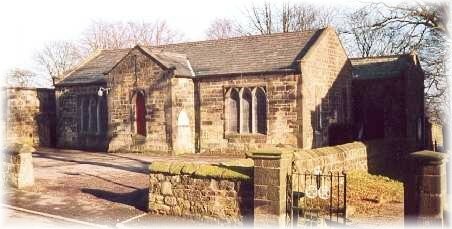 The Church was consecrated in 1842, the service was read by Rev.J.Tyson, and the communion was lead by The Lord Bishop. A collection plate was passed during the service, which raised £108. 18s. 9d, this money went to the costs of building the National School next to the Church. The consecration of St. Thomas was again recorded in "The Staffordshire Advertiser". This neat little structure was consecrated for divine service on Tuesday week, by the Lord Bishop of Hereford who officiated for the Bishop of this Diocese. 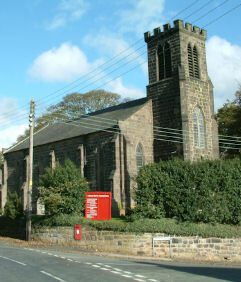 The locality in which this church is erected caused much interest to be excited, for long before the appointed time the villages of Mow Cop and Harriseahead were one scene of bustle and animation, and the Union Jack was seen flying from the ruined tower. The weather proving favourable, and the church being erected near the boundary of Cheshire and Staffordshire, considerable numbers were to be seen wending their way from both counties. The church is erected on the Staffordshire side, and but a short distance from that lofty eminence on which was formerly erected a beacon, to warn the country from impending danger, commanding a most extensive view. The National School at St.Thomas was the first school in the area. "The Board School" (Castle Primary) was built in 1890 under the legislation from The Wolstanton School Board. St.Thomas was closed in 1891. The pupils of St.Thomas like those of the Wesleyan Day School would have gone to form this new school. The School building was still used as a Sunday School up until more recent times. One more time we look at an Advert from "The Staffordshire Advertiser", requesting builders for the National School at St.Thomas on the 30th April 1842. Persons desirous of contracting for the erection of a NATIONAL SCHOOL, at Mow Cop, in the county of Stafford, may inspect the plans and specifications on application at the office of Mr Stanley, Architect, Grove Cottage, Shelton. The tenders to be sent to the Rev. F. Wade, Kidsgrove, Newcastle, on or before Thursday, the 5th of May next, to be addressed under the cover "Tender for Mow Cop National School." 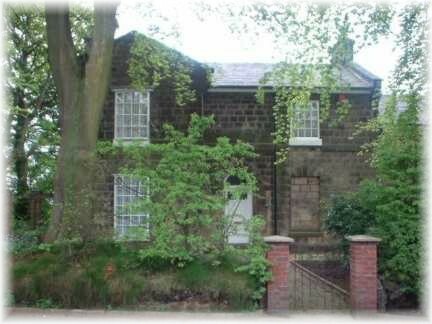 The vicarage was the last of St. Thomas three buildings to be completed and was sold whilst Jack Ward was vicar at the Church. It was sold to keep the running costs down and a house further up the road was purchased, and modernised to form the new vicarage.